CoQ10, or Ubiquinol is a very popular supplement for general health and as a supplement taken when people suffer from certain conditions. CoQ10 for bodybuilding is not as common, but it has benefits that should not be overlooked! 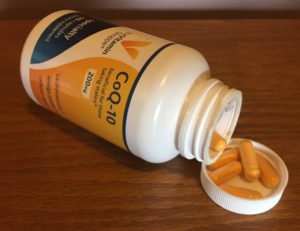 Also known as coenzyme Q10, coq10 is a commonly used supplement that is actually referred to as a “vitamin-like” substance that is found in virtually every cell in the human body! It is necessary for many vital functions and to ensure the proper operation of vital organs including the kidneys, heart, liver and pancreas. It is also required for many chemical reactions that occur in the cells of the body. On top of all that, coq10 is an anti oxidant as well. What makes Coq10 a beneficial supplement for bodybuilding? In addition to the benefits listed above, Coq10 is also responsible for providing energy to cells, which is one of the reasons it is considered a bodybuilding supplement. A study published in 2008 has shown that supplementation over a period as short as 14 days can increase time to exhaustion in various exercises. One benefit that can be derived from this extended time to exhaustion is that you may be able to trigger more muscle growth by extending the time under tension. The ability to perform even one additional rep before reaching true muscular failure will most definitely add to the intensity of the exercise, which translates to more muscle mass. Are there other studies that show Coq10 is a good bodybuilding supplement? A study on Olympic athletes training for the 2012 Olympics found that CoQ10 supplementation increased muscle power vs. those taking a placebo. Related article: Do I Need Protein Powder to Build Muscle? The study involved 100 German athletes, male and female. Researchers administered 300mg or a placebo for 6 weeks, measuring power output on a stationary bicycle during intense tests. The intensity of the cycling makes this exercise less of an aerobic type workout and a bit more like a leg weight workout. The results were published in the Journal of the International Society of Sports Nutrition in 2013. The study found that the test athletes that were given the 300mg of Coq10 had increased muscular power output by 11% on average over the study period of 6 weeks. The athletes that were taking the placebo showed an increase of 8% on average. This may not seem like a lot, but remember these are Olympic athletes that are already at a high level of physical fitness and even a small percentage of increase is significant. There are other studies that have conflicting results as to the effectiveness of Coq10 to help increase muscle mass and strength. This is true of many bodybuilding supplements. In my 30 plus years of bodybuilding, weight training and supplementation, I have found that each individual must experiment with supplements and see if they provide the desired outcomes. Many athletes I know will swear by certain supplements and at the same time, refer to others as a total waste of money. I believe that, unfortunately some supplements will work for a given bodybuilder and some will not. Some of the most proven supplements that increase muscle mass when combined with an aggressive workout plan include protein and creatine. What are the health conditions that Coq10 can benefit? Certain diseases of the muscles. People with these health issues may have lower levels of coenzyme Q10. Coq10 is synthesized in the body but levels star to drop as early as age 20. Intense exercise also lowers levels temporarily. It is a good idea to supplement with Coq10 to help keep enough in the bloodstream, especially for bodybuilders and other athletes that train hard and often. Additionally, the antioxidant properties of Coq10 helps prevent too much oxidative damage to muscle tissue. While muscles must undergo a certain amount of damage in order to adapt and grow, too much can slow down the recovery process leading to over training and lack of gains. CoQ10 helps keep this from happening. The recommended bodybuilding dose of CoQ10 is 300mg per day with food. It is better absorbed by the body when taken with food. Overall, Coq10 has general health benefits for almost everyone and Coq10 for bodybuilding is a great idea as well.